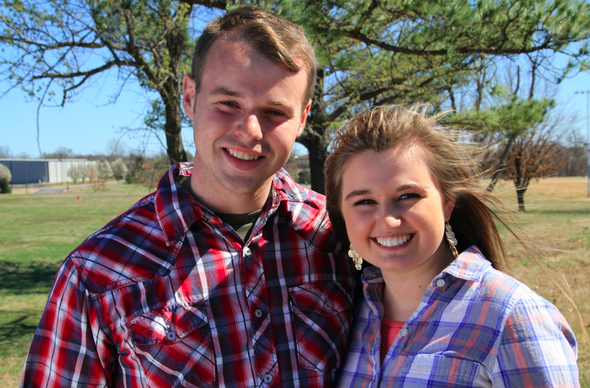 Spring flowers are budding, and so is a new Duggar romance! Joseph Duggar, 22, has entered a courtship with 18-year-old Kendra Caldwell. He made it official on March 7, 2017, by presenting Caldwell with a promise ring to demonstrate his commitment. The sweet moment took place in a field near his home. "We are so excited to share the news with others that we are courting," Duggar told People. "Our families are close friends through church, and this has allowed Kendra and me to get to know each other. She's the best!" "I'm looking forward to the side hugs and getting to do phone calls and texting," Caldwell said. She's also excited to "do ministry stuff together out in public and let everyone know we're courting." The two first met when Duggar was visiting the family of sister Joy-Anna's fiance, Austin Forsyth. Joy-Anna and Forsyth got engaged on March 2. "I'm looking forward to getting to spend more time with Joseph as we take this exciting step toward a new season in life," the 18-year-old adds. "It's a really wonderful moment!" We don't know much yet about Caldwell, but reports suggest that she's from Fayetteville, Arkansas, and her father is a preacher. There are even rumors that another Duggar is courting her sister -- but we'll have to wait and see about that! EXCLUSIVE: Meet the new 'Flip or Flop' pairs getting their own spinoffs! 'Dancing With the Stars' 2017: Here are all the celebs competing for the Mirror Ball!